Isaac’s Nursery was really fun to design. We did not find out our baby’s gender until he was born, so a majority of the room was gender neutral until… “it’s a boy!”. Of course I did have a boy concept and girl concept in mind. So below, were fabric options I found from babybedding.com. It is a fabulous website where you can order bits and pieces of bedding, and yards of fabric if you wish. I ordered samples of the fabrics I was interested in so I could see the coloring and feel the texture in person before purchase. I loved mixing and matching fabrics instead of buying a crib set with items I would not use – baby comforter and bumper. I love the site. We bought 3 yards of the white and green polka dot for curtains, 2 changing table covers in the greens, a white dust ruffle, and one sheet in the green circles, with plans to buy another. After Isaac was born I added in the animal print fabric with the blues, since he was a boy. I ordered a crib sheet the week after his birth. If Isaac would have been Isabel, that would have been a pink, red, black and white bird themed fabric. So, I played of those blue colors, especially the navy, to add the accents to this mostly lime and white room. The crib was a gift from the family I used to nanny for. We have had it for years in the basement and it brought me great joy to share it. I spent a lot of sweet moments with their cribs and I loved passing on to my own boy. We bought a new firm mattress. I hand-painted these animal silhouettes after pencil drawing them on. I simply printed out some pictures then used a table lamp to shine/enlarge the image on the the canvas. Then I painted. They still need a 2nd coat… maybe I will get there. Maybe. The adorable curtains were made by our friend and fabulous seamstress as a gift. I LOVE LOVE them. The only major piece of furniture bought new was the Ikea Hemmes dresser. It was a gift from my dad. We did buy the matching night table figuring it would be good by the chair and eventually as a night table. Both will grow with Isaac and could easily be in a kid, tween and young adult room. Besides storage, the main function for the dresser was as a changing table. I like a longer dresser to work with. After a kid is 12-18 months their feet start to hang over… I wanted room to grow and room to work: lay supplies, clothes, etc on the dresser. I used a basket (I think we got it as a gift basket years ago) to organize some basic stuff I wanted easily accessible. Everything else lives in the drawers. I made simple art out of things we had. I bought some frames from Ikea. The “loved” art is actually cut out from a gift bag. Under that, Isaac’s hospital wristband with a fabric sample behind it. I framed some of the cards I liked from showers. The hooks are from Pier One, bought 12+ years ago. For the locals it was way back when the Panera on Beechmont was a Pier One! Not sure how much I paid for it, but I remember loving it and wanting it so I probably did not get a great deal. This is another item that never had the perfect home. It very functional to hang clothes for the next day, Isaac’s wet towel, a jacket, etc. It is right next to the changing table, again, for function! The bookshelf was an old goodwill find. It used to be black and sit in my apartment before Doug and I were married, circa 2003. I certainly got my $15 out of that bookshelf. Doug gave it a fresh coat of white paint for the baby. The angel music box is one of the few things I have that was my grandmothers’ and I had to put something of nanny’s in the room. More fabric, cards, newspaper from Isaac’s birthday on the wall. The navy lamp is a cheapie from Target. A friend made this sweet owl, and my aunt made the blanket behind. The lamp I have had for over 15 years. It was given to me and never really matched anything. But in this room, It finally goes! On the side table: a clock, ipod with baby music, a bible and some toys and puzzles. It was so nice and neat before Isaac was mobile! 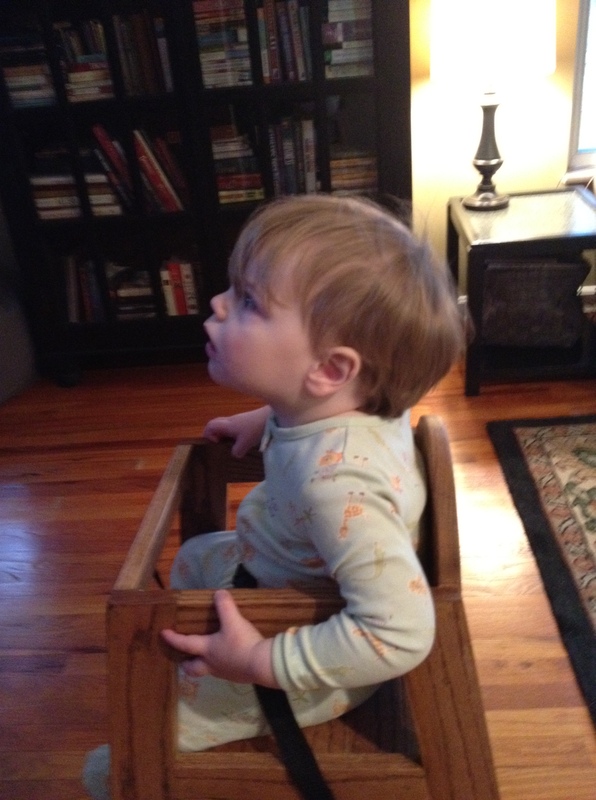 Over the chair is a framed onesie. Since we did not know the gender we had family and friends guess and write their names on a boy’s or girl’s onesie. This represents everyone who was right. Overall, I am happy with how the nursery turned out. We spent very little and repurposed many items. A few additions (not that noticeable in pictures) were extremely important to us. Those were an overhead fan with lights and blackout shades. Temperature and light are very important for little babes! One thing we were missing back then was a rug. Once Isaac was using the floor we added a navy rug, another free item! It definitely toned down the green. If I had one thing I would go back and change…it would be buying a bigger more comfortable chair for this room. We now spend lots of time reading and the glider is just not that great. Note the messy side table now filled with books? It is well used. Add a twin size bed for Isaac, maybe on the floor at first. Buy twin bed linens that coordinate with the room. Get rid of the chair to make more space available. We will have room to read on the bed! Change layout to make sense for 2 beds. Thinking and planning as we speak! Clear a side of the closet for Baby Boy’s clothes and gear. Change out the art and pictures, maybe add their names somewhere. Add a mobile for the baby? I never got to this one for Isaac. Put a 2nd coat on the animal canvases, if they get to stay (I might lose the animal them all together). This entry was posted in baby stuff, home decor, house tour, isaac memories and tagged animal, bedroom, blue, boy, lime, navy, nusery, white on December 15, 2013 by projectmomma. Isaac had his first haircut back in October (3 months ago). His hair was starting to look straggaley (is that a word?). It was falling in his eyes and hanging over his ears, so I thought that I might try to give him a little haircut. Nothing major, just a trim. Hmm, Doug has the scissors, but I have absolutely no idea what I am doing. So, I googled it. Yep, that’s what you do in 2013 when you want to learn something fast. I came across a few videos: How To Cut Toddler Hair at Home, watched a few, then felt a little more confident. 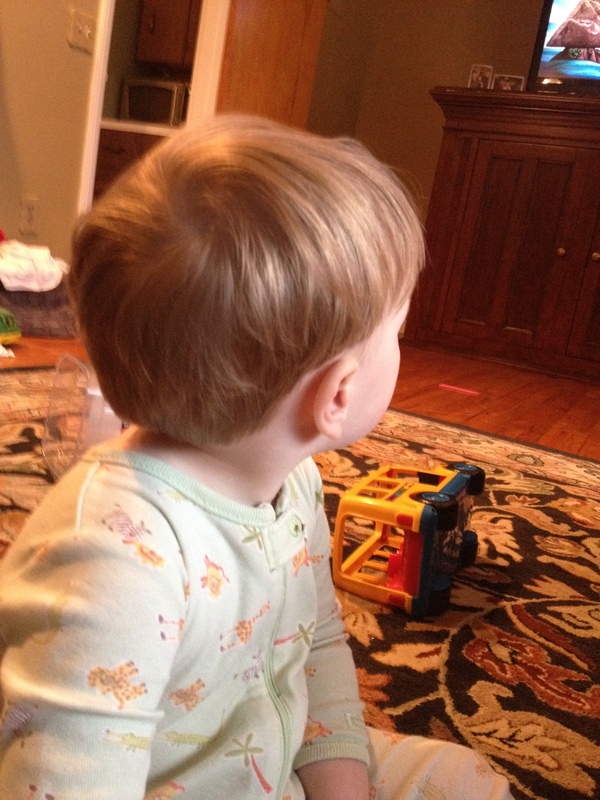 One video suggested looking at the back of his hair in three sections. Bottom, cut at one finger length, middle at two finger length and next section 3 finger lengths. That really helped me to envision how long the back should be. Cut his hair during a prime happy time – morning! 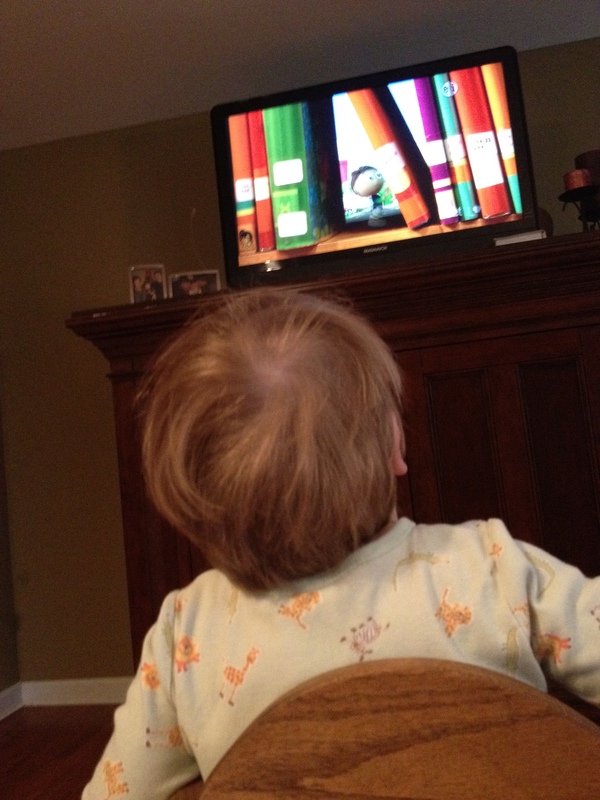 Distract him with his current favorite thing – PBS show called Super Why. 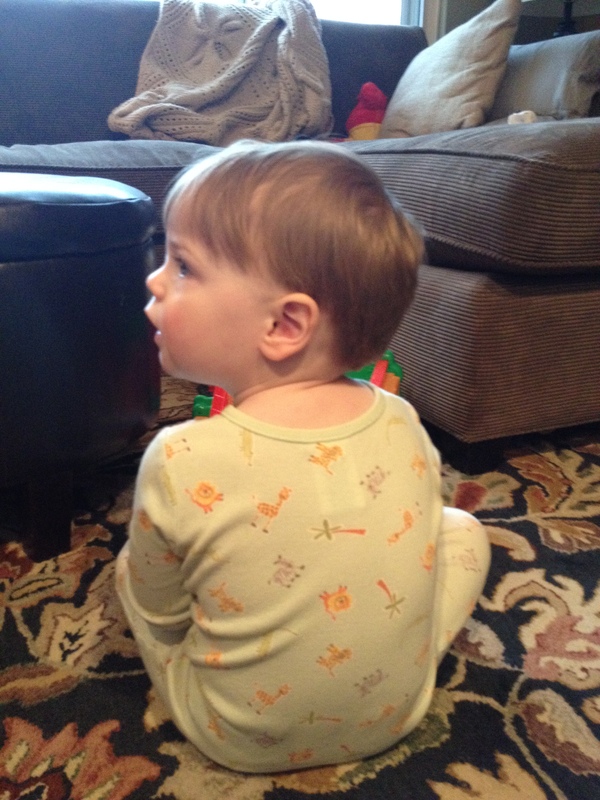 Use 2 bibs (one of them backwards) to keep the hair off his neck. Cut the bangs first, trim around the ears next, and if then trim the back. That way if he only let me complete one thing, his hair would be out of his eyes. Overall I was pretty happy with how it turned out. A few of his bangs are too long and I might try to fix them up so they aren’t crooked. 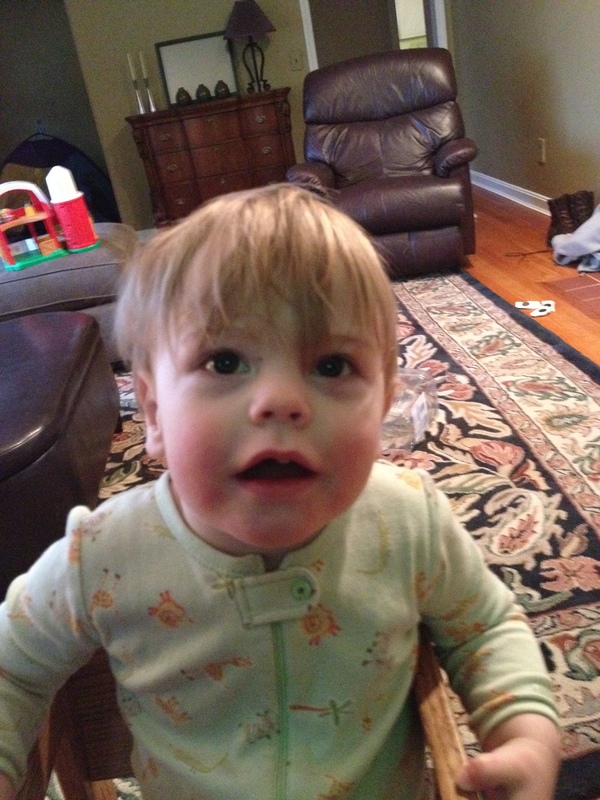 But, his hair is usually messy from playing and most of the time it’s pretty hard to tell. Anybody else tried to cut their kid’s hair? Go for it. 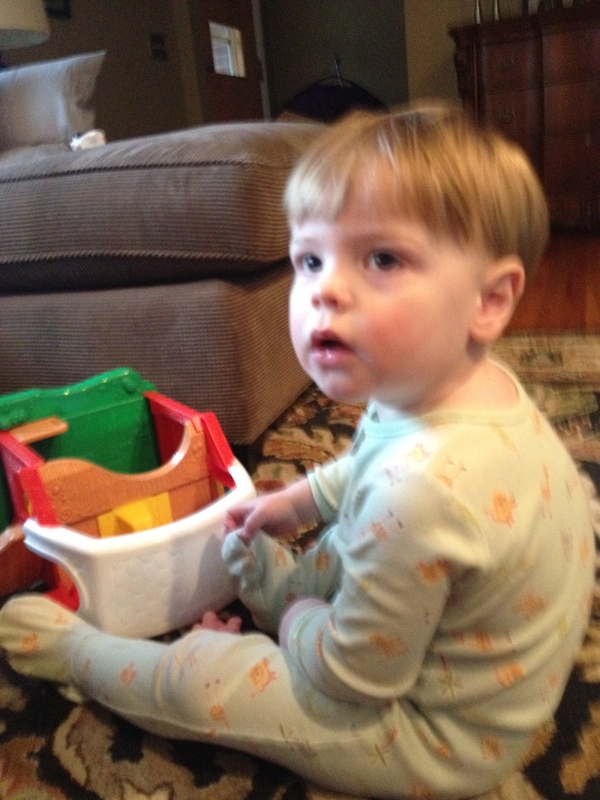 This entry was posted in baby stuff, diy, isaac memories, project and tagged boy, toddler haircut on January 27, 2013 by projectmomma.